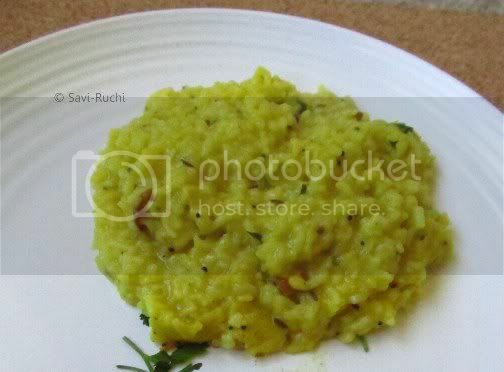 Has anybody tasted pongal prepared in Karnataka restaurants, especially in Sagars, Nalpaks etc?? I just love the way they prepare. It will be semisolid (consistency of bisibele bath) in state & tastes heaven!! But whenever I tried preparing, it wouldn't become that yummy. So, I got tips from a resturant owner :))) ( My hubby's grandfather was running a hotel business for almost 50 years & he, along with my father-in-law/mother-in-law keep sharing information on how to prepare dishes :)), lucky me, right?? ....). Although I have made slight modifications to what was told, I give the complete credit of this recipe to them & ......me just posting on their behalf. Soak the rice for 30 mins. Dry roast the moong dal for a minute. 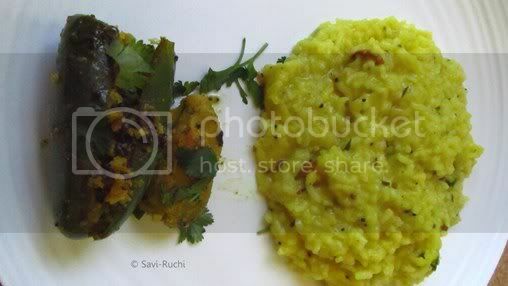 Mix the moong dal, rice together, add 5 cups of water & pressure cook for 3-4 whistles. Heat a broad kadai, add ghee & oil to it. When oil is hot, add jeera. To this add, grated ginger, cashewnuts. Add green chilli & curry leaves after cashewnuts become golden brown. Add pepper corns & add remaining 2 cups of water to this kadai. Add salt, pepper powder. When starts to boil, add the cooked moong dal, rice mixture. Add small amounts at a time, ensure no rice lumps are formed. Mix the whole & add coconut & coriander leaves. Cook the same in a slow flame for 5 mins. Pongal is ready to serve, serve it with raitha, coconut chutney or imli chutney. good luck & am sure it will be a hit.